In part two of my Women In Horror Interviews, I speak with Australian authors/editors Kaaron Warren and Amanda J Spedding. You can read Part 1 HERE. Amanda J Spedding is an award-winning author whose stories have been published in local and international markets earning honourable mentions and recommended reads. 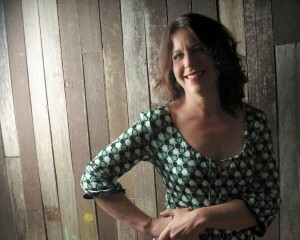 She won the 2011 Australian Shadows Award (short fiction) for her steampunk-horror ‘Shovel-Man Joe’. She is the owner and operator of Phoenix Editing and Proofreading, and between work is currently working on her first novel and awaiting the mid-year launch of her horror comic, ‘The Road’. Amanda lives in Sydney with her sarcastically-gifted husband and two very cool kids. What first attracted you to the horror genre? Why do you write and read horror? KW: Secrets and truths. I don’t like a happy ending in stories because happy endings are predictable and I want to be surprised. I write it sometimes because it’s my way of dealing with a world I have no control over. I read it because there are no holds barred and that’s the same with writing it. There are no barriers to the story; no niceties. AJS: Who doesn’t love a good scare? Really, who doesn’t? Well, my father for one, but my love of horror rests squarely on his shoulders (although he refuses to accept responsibility!). I remember when he read Poe’s The Raven to me when I was about five; I was enamoured with the cadence and the bleak imagery. I’ve sought out the darker side of storytelling since. There’s a beauty in horror I just love. The beauty in the struggle for survival, in the decisions (good or bad) a character makes, in how they deal when all appears lost. It’s that sliver of hope in a hopeless situation that draws me to the genre. It’s what I try to bring to my own writing; to create a reality within unreality that would have a reader wonder what they’d do in the same situation. The more awful the situation the better. That’s when I get to showcase the mettle of a character; when they’re stripped back to their true selves, their primal selves. There’s an honesty to horror not a lot of other genres get to show. It’s a great place to play! How do you feel about Women in Horror month? It’s most certainly warranted, but recently Acting HWA president Lisa Morton said she wished it was a “Celebrate-Horror-Writers-Regardless-of-Gender-Month”. What are your thoughts? KW: I agree to a certain extent. However, many names mentioned during the month may not receive the spotlight otherwise. I don’t really like categories of anything because they can mean people focus on that one element and perhaps judge a writer for it. However, they can be useful for highlighting names. More categories, I say! AJS: I have mixed feelings about WiHM. To my knowledge I’ve not been subject to gender prejudice within the industry, but I’d be a fool to think it doesn’t occur. Unfortunately, there is a resistance to women horror writers, and February seems to unleash the worst of those offenders. I’ve seen some truly dreadful blog posts about a woman’s “ability” to write in the genre let alone be good at it; that WiHM is a personal affront to male horror writers and the male population as a whole. Last year was a particularly godawful time for these types of posts, which, ironically, only furthers the need for WiHM. Horror is often seen as the ‘man cave’ of speculative fiction. One of the great things about WiHM is that it showcases female horror writers and perhaps results in someone who’d not normally read a horror story written by woman to give it a try. Would I like February to be ‘Celebrate Horror Writers Regardless of Genre Month’? Wouldn’t it be nice if all writers, regardless of gender, were judged solely on their work all the time. Sadly, that’s not the reality. My wish would be for female horror writers to be held in equal standing with our male counterparts. What are your perceptions of the number of female horror authors out there right now? What should the wider community be doing to encourage them? KW: I’m one of the judges for the Shirley Jackson Awards this year and it’s very clear: there are many, many talented female horror writers today. We can encourage all authors by reading widely and with an open mind. Articles like this excellent one from Marty Young http://martyyoung.com/the-wonderfully-horrific-world-of-female-horror-writers/ are great because they can expose us to writers we may not have read, and tell us more about our favourite authors. AJS: I think there are a lot more female horror writers out there than most realise. What makes it difficult to judge is the amount of sub-genres and classifications being thrown around. When you add in the fact that some female horror writers use pseudonyms, the waters get muddier still. From what I’m seeing on social media, though, I do believe the number is growing, and that makes me a happy horror writer. How to encourage a female horror writer? Buy their work. Review. If you’re a fan, tell the author then spread the word. The same applies to any author regardless of gender and regardless of genre. If you love an author’s work, let them know; review; spread the word. And if you’re someone who hasn’t read a horror story written by a female author, why not source one. That’s great encouragement and support right there. There are many women writing paranormal romance. Do you think that has had a positive or negative influence on women authors in the horror genre? KW: This is not my genre, either writing or reading, but I know many women writing in the genre love horror as well as romance and I think they give both the respect they deserve. Paranormal romance is very separate from what is traditionally horror, so I don’t think one affects the other. AJS: Ooh, tough question. I can’t speak on behalf of other female horror writers. Personally, paranormal romance isn’t for me. If you’re looking at the general reading community, I don’t think most understand the difference between PR and horror – it’s all lumped in together. When I say I write horror, the response I normally receive is: “Like Twilight?” It’s that misconception I believe is based solely on gender; it’s not an option I believe would be offered if I were male. More often than not I have to explain the difference between paranormal romance and horror, and that my writing drags itself from the bloody abyss where monsters are born, not the sparkly, sepia tones I’ve often found in PR. It can be tiresome having to explain the why behind my choice of genre, and it’s irritating to have to explain it all, especially when paranormal romance is often suggested (unasked) as an alternative. I have found that paranormal romance does open some to reading horror, and that can only ever be a positive. Those who read paranormal romance may pick up a tome that treads more on the side of horror than what they’re used to. Call it a stepping stone, if you like, to the horror genre. Which women in horror inspire you and who should we be reading? KW: Here are just a few of many: Lisa Tuttle, Gemma Files, Caitlin R. Kiernan, Elizabeth Hand, Margo Lanagan, Kirstyn McDermott, Deborah Biancotti, Lisa Morton, Livia Llewellyn, Lucy Sussex, S.P. Miskowski, Alison Littlewood and Thana Niveau. AJS: Kaaron Warren – without a doubt in my mind one of the most nightmare-inducing horror writers about! If you haven’t read her work, you’re doing yourself a disservice. Stop reading this and go get a copy of her work… do it now! Caitin R Kiernan is another writer who isn’t scared to take a reader to some very dark places; she’s won a stack of awards for her writing. Let her be your tour-guide to her worlds, you won’t be disappointed. Shirley Jackson. I mean Shirley Jackson. If you’re new to horror, then this is the place to start. If you haven’t read any of her work then get thee to a bookstore! We’ll talk again when you stutter your way through your fawning over the brilliance of the lady’s writing. And finally, tell us about what you’re currently working on. KW: Lots on! I’m finalising a new story for the print edition of my short story collection, The Gate Theory. I’m researching a crime novel as part of my Fellowship with the Museum of Australian Democracy at Old Parliament House. I’m hoping to sell my two completed novels. I’m working on my story for the Review of Australian Fiction, an issue in which I’m paired with Michelle Goldsmith. And more…. AJS: By midnight Friday the 13th, I’ll have finished the first draft of my novel ‘The Lightning Tree’ (working title). It’s an apocalyptic tale set initially in a fantastical world before moving … well, before moving on elsewhere (no spoilers!) It’s a story of gods and monsters, survival and its cost. It’s driven from my short story ‘The Whims of my Enemy’, which I’ve always wanted to explore in greater detail. I get to create a world, culture, mythology then systematically destroy it. How can you not love writing horror? Thank you Kaaron and Amanda! Well, I hope you all found this discussion interesting and will support women in the horror genre! For more on Amanda’s writing, visit her blog, “Author, editor, caffeine-addict, wannabe ninja” – http://amandajspedding.com/ . You can also read one of her short stories for free at Cohesion Press. This entry was posted in Uncategorized and tagged amanda j spedding, horror writers association, kaaron warren, marge simon, stephanie m wytovich, women in horror month. Bookmark the permalink. And here is Part 2 of Women in Horror Month. Greg Chapman interviews Kaaron Warren and Amanda J Spedding. If you’re a lover of Dark Fantasy and Horror, check out this blog. Awesome thrills are to be had in the pages of these talented authors.